Born in Melbourne Australia February 10 1967. At the age of 15 Bradley Hughes was thrust into the golfing spotlight by qualifying as the youngest player ever to play a major Australian tournament- the 1982 Victorian Open. After a distinguished amateur career which included numerous representative teams for Victoria and Australia- leading amateur in the Australian Open and The Australian masters and victories in the Victorian Amateur 1987-1988 and the New Zealand Amateur 1988 Hughes turned professional at the age of 21 in October 1988. Three weeks later he had started his professional career with a bang- 7th Tasmanian Open 12th New South Wales Open and a win 1988 Western Australian Open to show he had what it took on the professional stage. Throughout his career Hughes played 3 seasons on the European Tour- 4 seasons on the Japan PGA Tour- 4 seasons on the Web.Com tour and 9 seasons on the United States PGA Tour. Hughes competed in all four of golf major championships- The Masters (1)- US Open (4), British Open (4) & PGA Championship (1) – 10 Major Championships with his highest finish a 16th place in the 1997 US Open at Congressional GC won by Ernie Els. Hughes finished runner up in the 1992 KBC Daiwa Open (Japan) losing in a playoff to TM Chen. He also finished runner up twice on the USPGA Tour- 1998 CVS Classic in Boston & the 1999 Kemper Open in Washington DC. He has also finished runner-up in the Victorian Open, NSW Open, Tasmanian Open, Palm meadows Cup, Players Championship, NZPGA Championship & the Australian Masters in Australian PGA competition also. 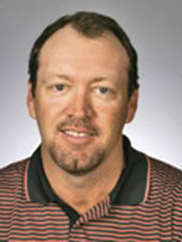 Hughes represented Australia on two occasions in The World Cup of Golf - in 1996 Cape Town South Africa and in 1997 at Kiawah Island South Carolina. His golfing highlight was being a member of The International Team in the very first Presidents Cup in Washington DC in 1994. Since scaling back his competitive golf in 2008 Bradley Hughes has now become one of the world’s leading golf instructors. His YouTube videos have amassed over 3.5 million views & his thread at golf forum Secret In The Dirt is the highest read forum with almost 1 million views to date. His professional students include Robert Allenby, Greg Chalmers, Brendon Todd and Russell Knox. He has also helped European Tour players Jason Scrivener, & Brett Rumford and worked with Major Champions Vijay Singh and Shaun Micheel. His inspired instruction thoughts have also attracted the attention of established sports stars in other fields including cricketers Dean Jones & Alan Border, footballers Sam Fisher & Michael Roberts and the icing on the cake 14 time Major Tennis Champion Pete Sampras- whom has visited Bradley in Australia for lessons as well as Hughes spending time with Sampras at his residence in California. In March 2015 Hughes was installed as professional instructor for Australian Major Champion Steve Elkington’s Secret Golf online site- which will soon become the world’s premier golf site for golf instruction from not only Hughes but Elkington himself, PGA Champion Jason Dufner, PGA player Pat Perez and Hall of Fame Masters and PGA Championship winner Jackie Burke Jnr. Hughes prides his instruction on being simple and imaginative with the focus on being able to allow the student to feel and understand what the true fundamentals of the golf swing are. All based on his experiences as a high calibre player and from playing with, asking questions and learning from over 145 Major Championship winners including Greg Norman, Gary Player, Tiger Woods, Nick Price, Payne Stewart and many others throughout his career. Hughes also passes on information about course management- equipment- the mental game and the short game from his vast experience as a player on the world stage- an experience few instructors can offer. Bradley Hughes' e-book 'The Great Ballstrikers' - released in January 2018- has received rave reviews with some people claiming it to be "absolutely the BEST golf instruction book I have ever read".